its a X-ray chest PA (Posterio-anterior) view of a 14 year old boy who was presented to us with Central cyanosis and shortness of breath. what is the likely diagnosis? and how? Post your answer as comment. Answer will be published after five answers. Answer: X ray shows typical boot shaped heart of Teratology Of Fallot (TOF). Which was later confirmed by echocardiography. But there is a dark area at the right side of the film which looks like gastric shadow. 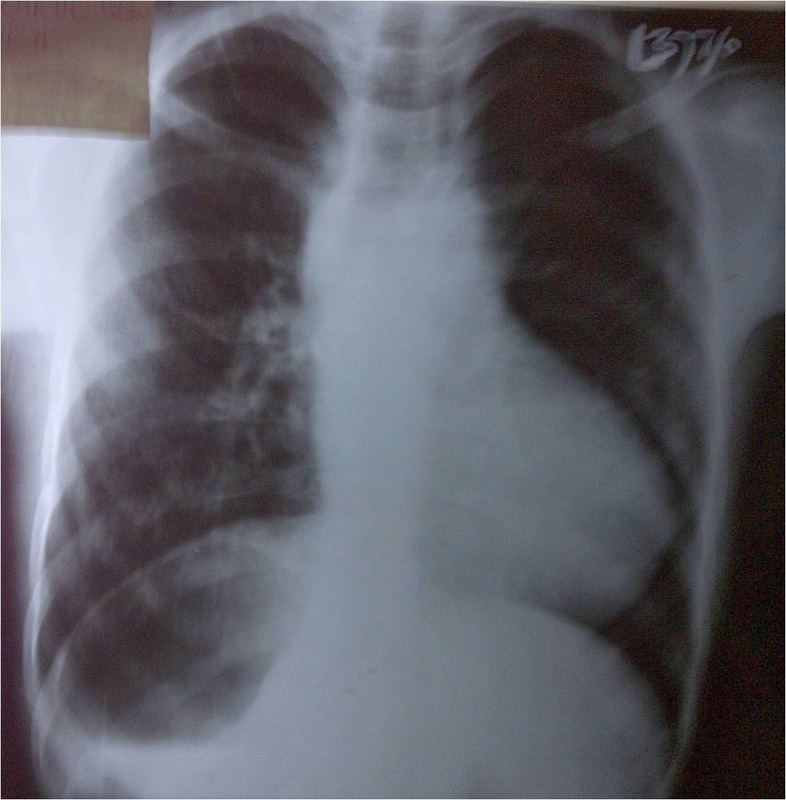 This raises suspicion of situs inversus with levocardia or situs incompletus but Dr. Tayyab Akhtar says, "we were unable to confirm situs inversus with levocardia or situs incompletus because patient was unwilling to stay at the hospital". The frequency of situs inversus with dextro cardia is 1 per 10,000 births while the frequencey of situs inversus with levocardia is 1 per 22,000 births. heart is a bit boot shaped TOF lekin i m confused whether its a cavity with air fluid level in right lower zone or its a a stomach bubble ...but thats on the left side so either film is upside down or its situs inversus .....bottom line i m not sure.